Editor: Greta Brasgalla, Folger National Teacher Corps and Curriculum Specialist at El Dorado High School, El Paso, Texas. Students will engage in Socratic questioning to further their analysis of the mechanicals in the play. Students will use research to enhance their understanding of the scene. Students will synthesize research and text to draw conclusions about the characters and their purpose in the play. For the Socratic questioning seminar, rotate the following student roles: actors, researchers, note takers, text connectors, and outside connectors. Researchers: Using technology, these students look up references, find pictures, or anything the class needs further information about. Note takers: These students record class information: important points, research, insights, etc. They can transfer their information to a chart tablet or a class Wiki. Text Connectors: These students connect what is happening in the scene to other scenes in the play. Outside Connectors: These students connect what is referenced in the scene to outside sources: references in movies, books, news, etc. Below are text-specific questions to guide the close reading of each scene. For each line, you can assign the researcher to look up the question and report back. Have students make connections while reading as well. Record your class’s discussion on the class Wiki or on chart paper. line 11: Quince tells his assembly what play they will produce: “The most lamentable comedy and most cruel death of Pyramus and Thisbe.” What kind of play do you, as an audience, want to see? Why would the play be both "lamentable" and a "comedy?" What does this title make you think of the players? Look up some of Shakespeare's play's title pages, like Romeo and Juliet . How does this title compare? line 20: Quince assigns the roles in the play. Bottom asks if Pyramus is “a lover or a tyrant?” Shakespeare’s audience was used to seeing plays about kings and lovers. Get a list of Shakespeare’s and figure out how many he wrote that weren’t about kings or lovers. line 45: Francis Flute protests playing a woman—on the Elizabethan stage, women’s roles were played by young men and boys. Why? line 75: Why are the players concerned about the Lion being too frightening? What could happen to you if your play displeased the king or queen at the time? The Lord Chamberlain’s Men, Shakespeare’s company, were once in danger of their lives when Queen Elizabeth I saw herself in the deposed monarch in Shakespeare’s play Richard II. Exeunt: Shakespeare didn't have a curtain to drop between scenes or acts to denote an end. Instead, he and his fellow playwrights would have everyone onstage exit at the end of one scene and to have one or more other characters enter for the next. line 9: Bottom is concerned that their play is too violent. Who in the audience is he most concerned about? What solution does he propose? 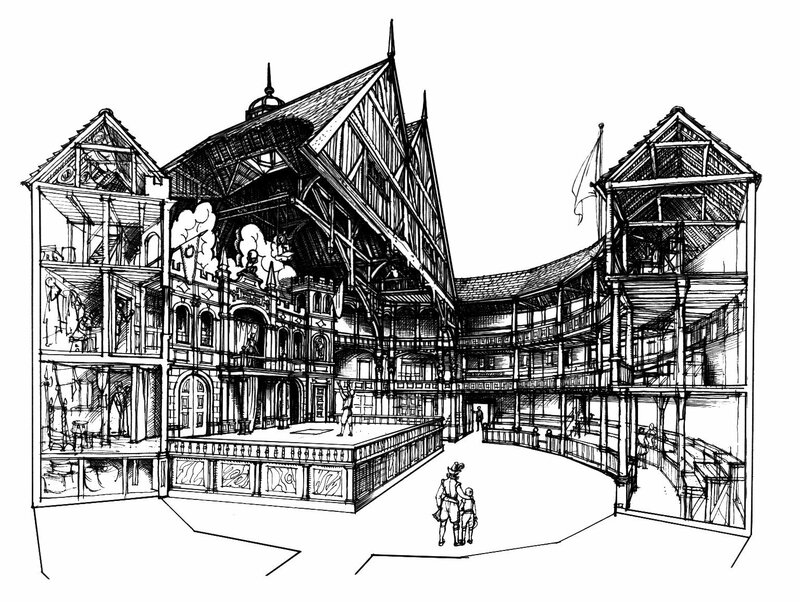 line 46: During their rehearsal, Quince says that he hopes to have the moon shining on the night of their performance because “Pyramus and Thisbe meet by moonlight.” At Shakespeare's Globe Theatre, what type of lighting was used? What devices did Shakespeare have available to him to tell the audience where they were and what time it was? line 61: Quince also points out the need for a wall through which the lovers will whisper. What is their solution? line 90: Flute speaks all his lines at once. In the 16th century, actors learned their lines from “sides” – papers that contained their lines only, and perhaps a cue or two. line 134: The mechanicals’ play begins with a prologue. Where else have you seen a prologue, and what is its function? line 179: The "O" in Shakespeare's lines encompasses all of the emotion the character is feeling. (ie: “O, she doth teach the torches to burn bright!”) What emotion is Bottom/Pyramus playing here with so many "O’s"? Ham it up and make a big noise with each "O." This part is especially fun for the best over-actor in the class. line 260: Throughout the play, the married couples add their own comments and interjections. Live theatre includes a live audience with live reactions. Have you ever experienced something like that today? Describe it. Did you participate? What were your reactions? Did you see or hear people who didn't agree with you? line 291: Even more fun: bad rhymes and stage deaths for Pyramus and Thisbe! What did the audience enjoy about the play? What did you enjoy? What three things did you learn today that were essential to your understanding of the scene? What two things were nice to know and added to your understanding? What was one random fact you learned today? How does Shakespeare use humor in the Mechanical’s scenes? What purpose do the Mechanicals serve in the play? How do the Mechanicals act as foils to the lovers and royals in the play?